Hematopoietic stem cells (HSCs) are tissue-specific adult stem cells capable of differentiating into all blood cell types to ensure homeostasis of blood throughout life. The first signs of hematopoiesis (blood cell formation) occur during embryonic development in blood islands within the yolk sack and in the aorta-gonad-mesonephros region. These early HSCs migrate in later developmental stages into the placenta and fetal liver, which serve as the main compartments of prenatal hematopoiesis. Shortly before birth, HSCs migrate to bone marrow where adult hematopoiesis takes place throughout life. HSCs were the first somatic stem cells to be discovered. Research on HSCs dates back to their discovery in the 1960s, and has led to the development of fundamental concepts in stem cell biology, such as the stem cell niche, stem cell self-renewal, and asymmetric cell division. HSCs are used as a model to understand hematopoiesis regulation and to elucidate mechanisms driving stem cell self-renewal or the directed differentiation towards specific blood cell types. Clinically, HSCs or HSC-enriched fractions are used to treat blood related diseases, like leukemia, sickle cell disease, or the immune defect severe combined immune deficiency (SCID). Besides bone marrow, HSCs can be found and isolated from blood sources, such as apheresis products or umbilical cord blood. Depending on the starting material, HSC content varies from 0.1 to 2.5%. Engraftment analysis of HSC populations using xenograft models revealed that the majority of cells migrating into the recipient’s bone marrow express the surface marker CD34. Furthermore, these cells lack expression of lineage-specific markers (i.e., are lin–), show no or very low expression levels of CD38, and express CD59, CD90, and CD117. These cells show high clonogenic and engraftment potential but represent a small fraction of the CD34+ cell population. Surface marker expression of HSCs at different stages of differentiation. Miltenyi Biotec has created dedicated application protocols to work with and analyze HSCs. Samples containing human HSCs can be obtained from various sources, including bone marrow, umbilical cord blood, or mobilized apheresis. To study HSCs, it may be necessary to prepare samples upfront to, for example, isolate mononuclear cells. For detailed information, see the MACS Handbook chapter Human Blood. Miltenyi Biotec has developed numerous products for the straightforward magnetic separation of human HSCs. Positive selection enables the direct labeling and separation of human HSCs, whereas depletion strategies effectively remove non-HSCs to isolate untouched HSCs. HSC-containing samples are routinely processed over a density gradient centrifugation to pre-enrich mononuclear cells as starting material for subsequent HSC isolation. CD34 MicroBeads and related isolation kits allow positive selection of human HSCs and progenitor cells from various starting materials. CD34 is a well-established marker for these cells, and is also expressed on hemangioblasts, endothelial progenitor cells and mature endothelial cells. The CD34 MicroBead Kit UltraPure, human is especially formulated to handle debris-rich samples. Similarly, the CD133 MicroBead Kit – Hematopoietic Tissue, human enables positive selection of HSCs and progenitor cells, optimized for hematopoietic tissues. CD34+ cells isolated from a debris-rich PBMC sample. The CD34 MicroBead Kit UltraPure, human was used to separate HSCs from a sample of PBMCs. Cells were stained with CD34-PE, CD45-FITC, and propidium iodide solution. Flow cytometry analysis shows high purity after enrichment. The Lineage Cell Depletion Kit, human is designed to magnetically label mature cells (T cells, B cells, NK cells, dendritic cells, monocytes, granulocytes, and erythroid cells) and their differentiation-committed precursors. Depletion of the labeled cells results in the enrichment of untouched HSC and progenitor cells. CD34+ cells in the lineage cell–depleted fraction. Analysis of a bone marrow mononuclear cell (BM-MNC) population before and after lineage cell depletion. Lineage-negative cells were isolated from BM-MNCs using the Lineage Cell Depletion Kit, human and an LS Column. Cells were fluorescently stained with CD34-FITC and all fractions were analyzed by flow cytometry. HSCs are routinely analyzed by flow cytometry based on various extracellular and intracellular markers. 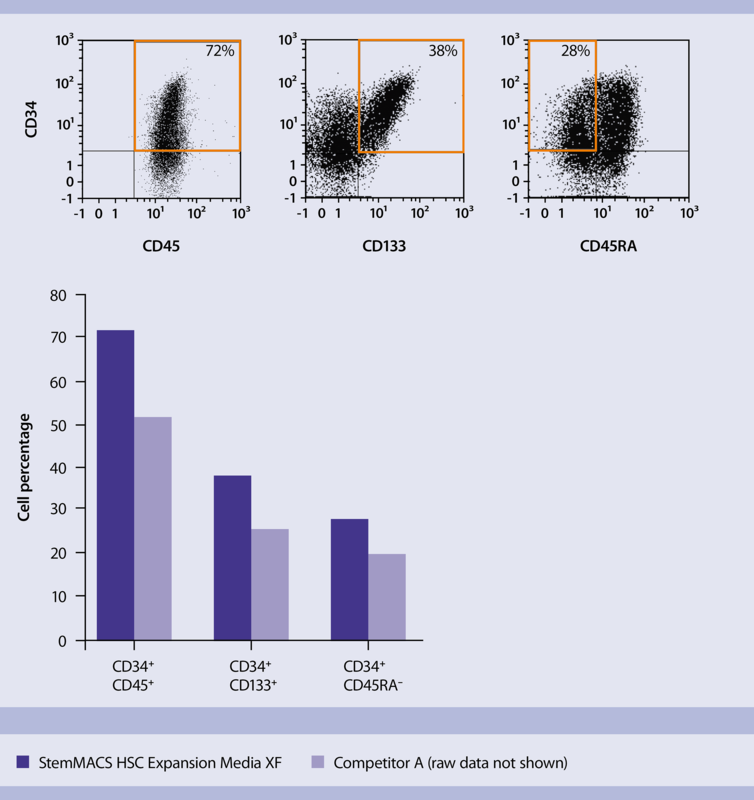 The MC Antibody Cocktails simplify the flow cytometry analysis of cells separated by MACS Technology. All antibodies are optimally titrated to be simply added to an aliquot of a cell fraction before analysis. Miltenyi Biotec also offers a wide range of unique and standard monoclonal antibodies for research of HSCs and progenitor cells, including CD34, CD38, CD133, CD117, and Anti-Sca-1. Fluorochrome-conjugated MACS Antibodies are perfectly suited for the identification, enumeration, and characterization of HSCs, which can be combined into panels tailored to specific research needs. An online tool to quickly construct the right multicolor flow cytometry panel for each research project can be accessed via the Related documents panel to the right. For details about Miltenyi Biotec antibodies and dyes for cell analysis, see MACS Flow Cytometry antibodies and kits and support reagents. The number of HSCs available in human samples is often insufficient for downstream applications. HSCs can be expanded in culture with HSC-relevant growth factors to obtain higher cell numbers or to elucidate mechanisms and signaling pathways driving self-renewal or differentiation. Early-acting cytokines – human stem cell factor (SCF), Flt3-Ligand, and thrombopoietin (TPO) – expand primitive HSCs, although current HSC culture systems allow only limited expansion and maintenance of primitive HSCs that are able to engraft and completely restore the entire blood system. StemMACS™ HSC Expansion Media XF is specifically formulated for the robust expansion of HSCs from umbilical cord blood, bone marrow, or peripheral blood. The StemMACS HSC Expansion Cocktail, human, an optimized set of cytokines, can be added to the medium to create a xeno-free culture environment that preserves high levels of primitive CD34+CD133+ HSCs. Expansion of HSC from umbilical cord blood. CD34+ cord blood cells were expanded for 7 days in StemMACS HSC Expansion Media XF (dark purple bars) or an alternative medium (light purple bars) supplemented with the StemMACS HSC Expansion Cocktail. The cell surface phenotype was assessed by flow cytometry. Expansion of HSC from umbilical cord blood. CD34+ cord blood cells were expanded for 7 days in StemMACS Expansion Media XF (red bars) or an alternative medium (blue bars) supplemented with the StemMACS HSC Expansion Cocktail. The cell surface phenotype was assessed by flow cytometry. HSC-CFU assays are used to examine the proliferative and differentiation potential of HSCs in vitro. Cells are cultured in a semi-solid culture medium supplemented with growth factors that drive differentiation into the myeloid lineage, resulting in outgrowth of distinct colonies from a single cell. A video tutorial describing how to set up and conduct an HSC-CFU assay, plus pitfalls to avoid, can be accessed in the Related documents panel to the right. Miltenyi Biotec offers different formulations of StemMACS HSC-CFU Media, human, our standardized, semi-solid medium based on methylcellulose in IMDM, supplemented with FBS, BSA, and different growth factors. 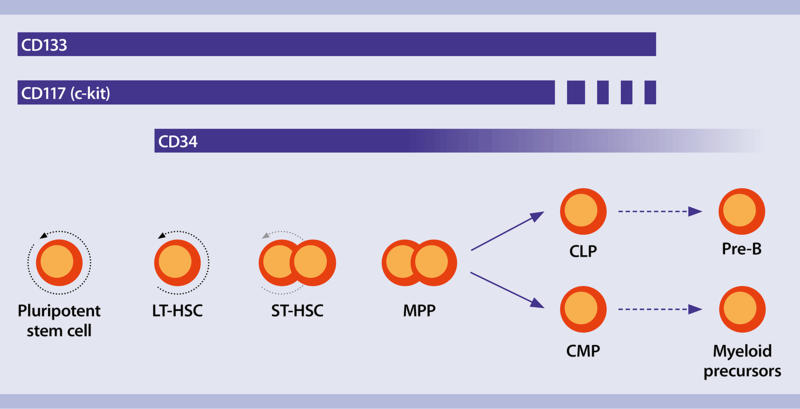 The StemMACS HSC-CFU media are designed to maximize growth and differentiation of progenitor cells and allow the clonal progeny of a single cell to grow in a distinct cluster or colony. They are produced under tightly controlled manufacturing conditions and use highly qualified raw materials to provide a consistent and optimally performing colony assay. Viral transduction is a fast and efficient method to study gene function, modulate gene expression, or as a potential vector for gene correction in gene therapies. The transduction of HSCs is especially interesting because of their potential to permanently cure hematopoietic defects. The modification of HSCs with retroviral vectors often requires the presence of a transduction-enhancing reagent. Polycationic reagents induce aggregation of vector particles and facilitate binding to target cells via electrostatic interactions. Bridging molecules, such as recombinant fibronectin, interact with both vector particle and cell membrane. Transduction performance can be enhanced with centrifugation. Miltenyi Biotec offers the novel transduction enhancer Vectofusin-1®, a fully synthetic non-toxic cationic amphipathic peptide that supports high transduction levels with low amounts of retroviral vector. When added to culture medium, Vectofusin-1 promotes the entry of several retroviral pseudo-types into target cells. Viral transduction of CD34+ HSCs. Cells were isolated from cord blood and pre-stimulated for 24 h either in StemMACS HSC Expansion Medium XF (A) or in HSC-Brew GMP Medium with 2% human serum albumin (B) and supplemented with recombinant human TPO, SCF, and Flt3-L. CD34+ cells were then transduced with lentiviral (LV) vectors encoding GFP in the presence of Vectofusin-1 (A,B) or in recombinant fibronectin-coated plates (A). In one protocol, LV vector and Vectofusin-1 were diluted in equal volumes of serum-free medium, mixed and incubated for 5–10 minutes before addition to the target cells in StemMACS HSC Expansion Medium XF containing cytokines. In a second protocol, GMP quality reagents were used (B,C) and vectors and Vectofusin-1 were diluted in equal volumes of HSC-Brew GMP Medium without HSA, mixed, and incubated for 5–10 minutes before addition to the target cells in complete HSC-Brew GMP Medium. The transduction medium was replaced after 24 h culture. Transduction efficiency (A,B) and viability (C) were assessed 4 days after transduction. Two different baboon envelope constructs were used for lentiviral pseudotyping: BaEVTR and BaEVRless. Viral transduction of CD34+ HSCs. Cells were isolated from cord blood and pre-stimulated for 24 h either in StemMACS HSC Expansion Medium XF (A) or in HSC-Brew GMP Medium with 2% human serum albumin (B) and supplemented with recombinant human TPO, SCF, and Flt3-L. CD34+ cells were then transduced with lentiviral (LV) vectors encoding GFP in the presence of Vectofusin-1 (A,B) or in recombinant fibronectin-coated plates (A). In one protocol, LV vector and Vectofusin-1 were diluted in equal volumes of serum-free medium, mixed and incubated for 5–10 minutes before addition to the target cells in StemMACS HSC Expansion Medium XF containing cytokines. In a second protocol, GMP-quality reagents were used (B,C) and vectors and Vectofusin-1 were diluted in equal volumes of HSC-Brew GMP Medium without HSA, mixed, and incubated for 5–10 minutes before addition to the target cells in complete HSC-Brew GMP Medium. The transduction medium was replaced after 24 h culture. Transduction efficiency (A,B) and viability (C) were assessed 4 days after transduction. Two different baboon envelope constructs were used for lentiviral pseudotyping: BaEVTR and BaEVRless. Vectofusin-1 is a registered trademark of Genethon.